ArtLocal is a project initiative using art and creative thinking in localized public spaces throughout the city of Kettering. 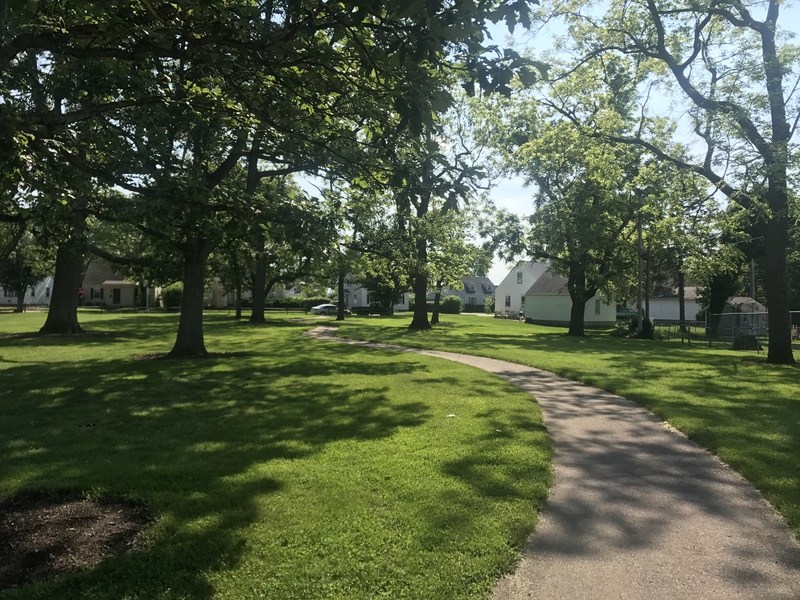 On June 9, Cities of Service hosted a block party to celebrate the Haverstick neighborhood, located adjacent to the Kettering Business Park, off of Forrer Avenue. 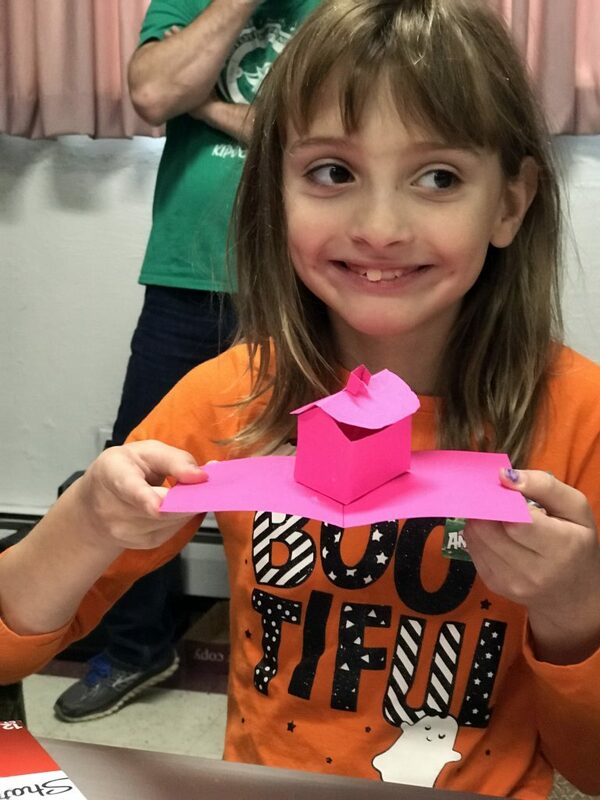 Art projects brought families together to be creative and have fun. 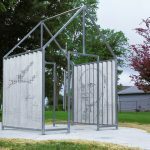 Help the Kettering community and contribute to a piece of public art! Once again, Jes McMillan and the Mosaic Institute of Greater Dayton invite participants of all ages to participate in creating large mosaic honeybees for a future public artwork in Kettering! Participation is free, and all youth should be accompanied by an adult. Join Jes McMillan and the Mosaic Institute of Greater Dayton during the biweekly "Art Lunch" at Rosewood Arts Centre and help to create mosaic honeybees for a future public artwork in Kettering! Art Lunch is gathering of artists and art lovers over a casual lunch get together. Share current projects, collected works or art stories. Bring a lunch and your love of art! Participation in the lunch and mosaic making is free. 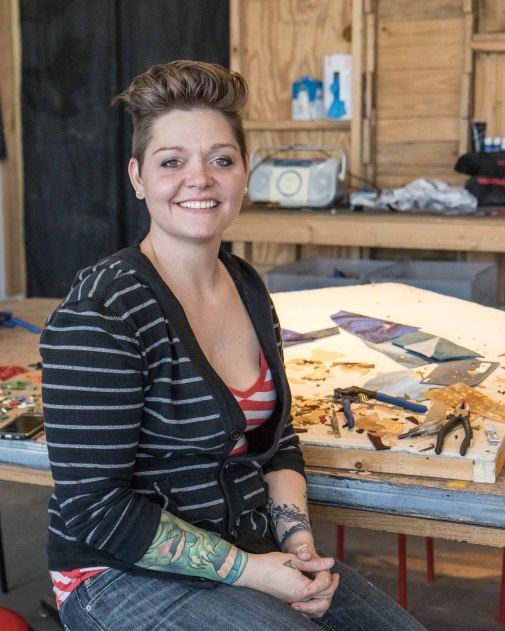 Jes McMillan and the Mosaic Institute of Greater Dayton invite participants of all ages to participate in creating large mosaic honeybees for a future public artwork in Kettering! Participation is free, and all youth should be accompanied by an adult. 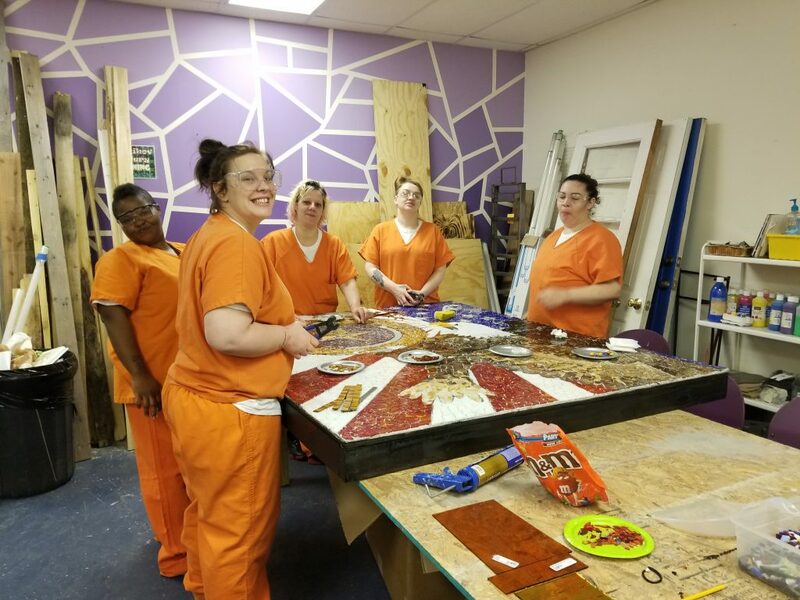 The City of Kettering’s CitySites ArtLocal Program has awarded Jes McMillan and the Mosaic Institute of Greater Dayton a commission to create a new permanent artwork. McMillan will work closely with residents in the Haverstick neighborhood of Kettering, including students from Beavertown Elementary School and the community at Rosewood Arts Centre. ArtLocal was established in 2017 to facilitate community participation in the development of a collaborative permanent artwork in public spaces throughout Kettering. This year, the Haverstick neighborhood was selected for ArtLocal, in partnership with Cities of Service (COS), a City of Kettering program dedicated to innovative ways to harness the power of volunteers and celebrate Kettering’s neighborhoods. 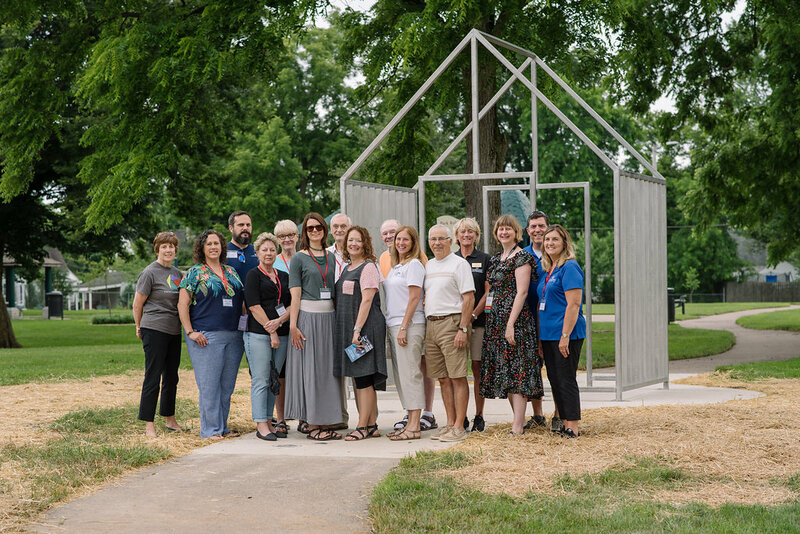 McMillan is the second artist to participate in the ArtLocal program, which completed its inaugural artwork this past June with artist Virginia Kistler of Gahanna, Ohio, in Kettering’s Oak Park neighborhood. 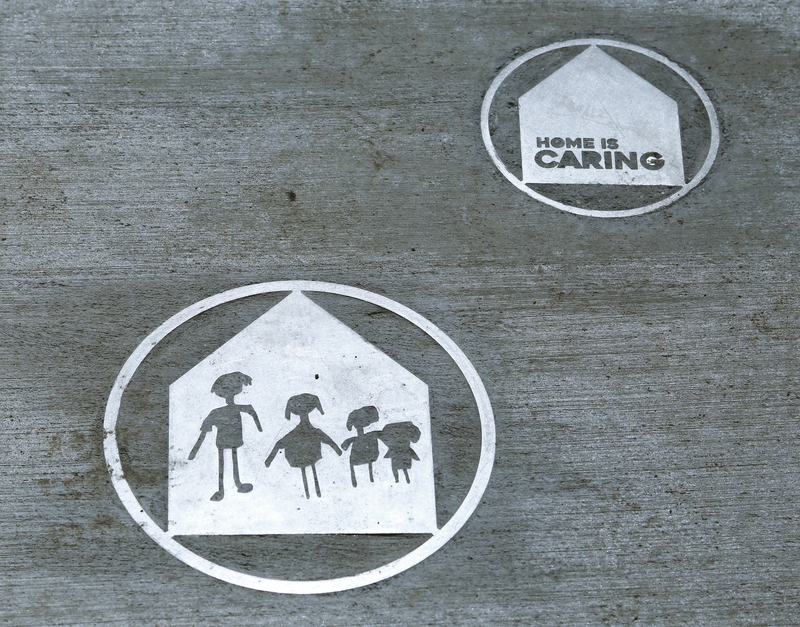 The work will culminate in mosaics embedded into the sidewalks of the Haverstick neighborhood. The mosaics will be inspired by children’s sidewalk games, offering interactive engagement with residents, and addressing an alternative to the neighborhood not having a public park. McMillan has been creating mosaics for over twenty years. In 2015, she founded the Mosaic Institute of Greater Dayton, whose mission is to inspire, empower and unify the community through art. 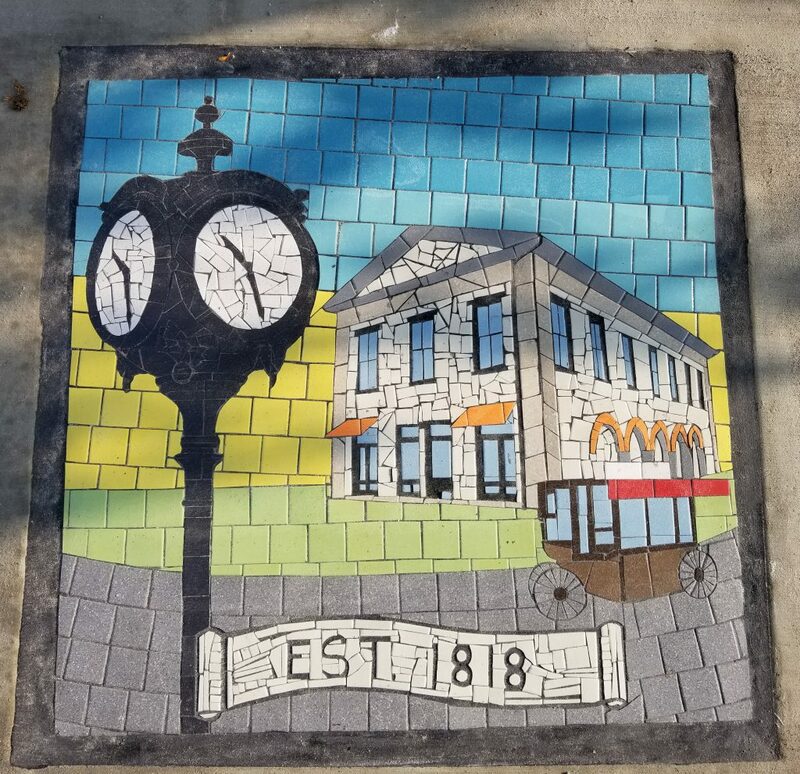 Recent projects include the commemorative sidewalk mosaics in Miamisburg, and projects with the Jewish Federation of Greater Dayton and the Montgomery County Courts Probation. McMillan received degrees in Industrial Design and Applied Arts from Point Park University and The Art Institute of Pittsburgh. ArtLocal is managed by Rosewood Arts Centre and the City of Kettering’s Parks, Recreation and Cultural Arts Department. Support for this project is made possible by CitySites, the Community Foundation for Kettering and the Ohio Arts Council. ArtLocal works in partnership with Cities of Service (COS), a City of Kettering program dedicated to innovative ways to harness the power of volunteers and address critical city needs. Kettering! Mosaic Institute artist Jes McMillan is creating a unique, collaborative public artwork with residents. Be a part of this project by visting her at Make a Difference Day! 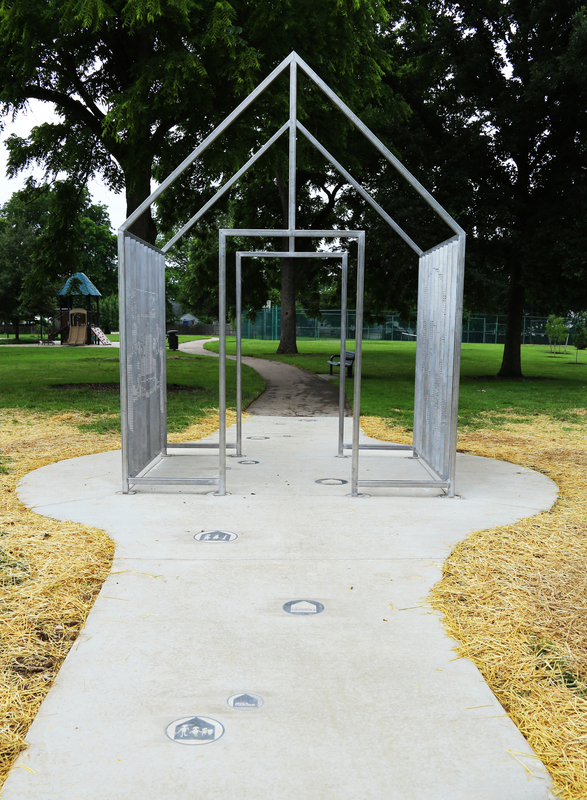 The inaugural ArtLocal public artwork, created by Virginia Kistler, was dedicated on Saturday, June 23, in Oak Park! View images below (click image to view larger). The City of Kettering CitySites Public Art Program is proud to announce the dedication of a new artwork by Virginia Kistler of Gahanna, Ohio. The dedication took place on Saturday, June 23, 2018 from 10:30 am until 12 pm with remarks at 11 am in Oak Park, Kettering. The artwork is the inaugural piece in the ArtLocal program, an initiative utilizing art and creative thinking in localized public spaces throughout the city of Kettering. 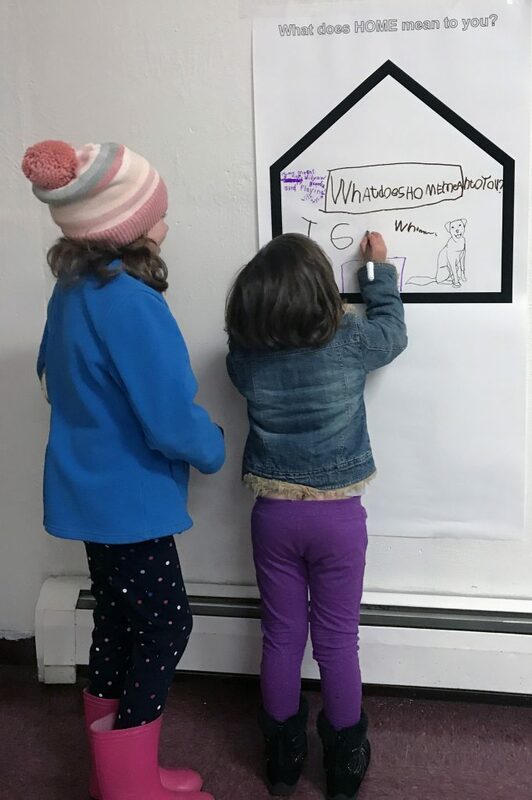 Since fall 2017, Kistler facilitated hands-on workshops and conversations with children, residents and veterans at Greenmont Elementary School, Greenmont Oak Park Community Church, and VFW Post 9927 to capture the values and spirit of the Oak Park neighborhood. Through these interactions, Kistler’s stainless steel artwork Mutual Homes reflects the meaning of home to Oak Park residents. Kistler was inspired by the characteristics of Oak Park’s 1945 Cape Cod-style homes, as well as the words and images shared by its residents. She was also inspired by the influence of manufacturing in the neighborhood history; Oak Park developed across from the Delco Plant (later a General Motors plant, and currently owned by Tenneco) with involvement by Charles F. Kettering, with many residents working at Gentile Air Force Base. 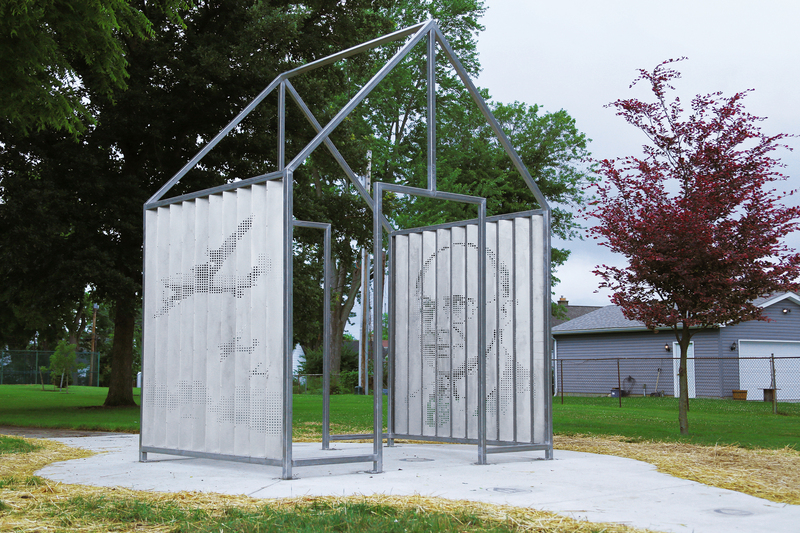 Mutual Homes includes a lenticular patterning of relevant images including Charles F. Kettering, as well as impressions of the drawings and words of residents placed into the surrounding landscape. Kistler received her MFA from the Columbus College of Art and Design and has recently completed commissioned artworks for the Dayton Metro Library, the Lincoln Motor Company and the City of Columbus. She is an interdisciplinary artist working primarily in sculpture and photography while using a variety of media—laser cut rubber, CNC router-cut plastic, and 3D printed plastic. Her work focuses on the ubiquity of urban landscapes and the absence of biodiverse spaces. She has shown work both nationally and internationally. Kistler was also the subject of a solo exhibition at Rosewood Gallery in Kettering, which was on view from April 16 – May 18, 2018. Support for this project is made possible by CitySites, the Community Foundation for Kettering and the Ohio Arts Council. 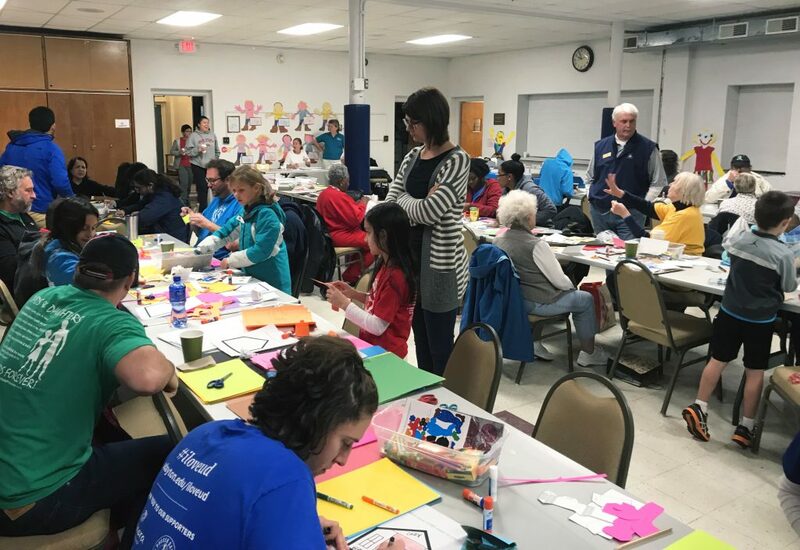 In its inaugural year, ArtLocal worked closely with Cities of Service (COS), a City of Kettering program dedicated to innovative ways to harness the power of volunteers and address critical city needs. ArtLocal is an initiative of the City of Kettering’s Cultural Arts division. Through Rosewood Arts Centre, which provides arts education opportunities, and CitySites, a percent for art program, ArtLocal is an artist-led, collaborative public art program based in Kettering’s neighborhoods. CitySites is a percent for art program recognizing artistic excellence, accessibility to the arts for all people, and the positive impact creativity has on our community and quality of life in the City of Kettering. With over 25 artworks throughout Kettering, CitySites continues to enhance our environment, inspire our residents and celebrate our legacy as a premier city to call home. For more information about the project, please visit www.playkettering.org/citysites. The City of Kettering CitySites Public Art Program is proud to announce the selection of Virginia Kistler for the inaugural ArtLocal public art commission. Kistler will create a new public artwork, in collaboration with residents of Kettering, to be installed in Oak Park this spring 2018. Kistler is commissioned through ArtLocal, a new CitySites initiative using art and creative thinking in localized public spaces throughout the city of Kettering. Through hands-on workshops, dialogues with residents and special events, ArtLocal will facilitate community participation in the development of collaborative permanent artwork in public spaces, such as neighborhood parks. ArtLocal is managed by Rosewood Arts Centre and the City of Kettering’s Parks, Recreation and Cultural Arts Department. Kistler will be leading activities with the community this fall, including on Make a Difference Day in partnership with the Cities of Service program in Kettering, taking place on Saturday, October 28. 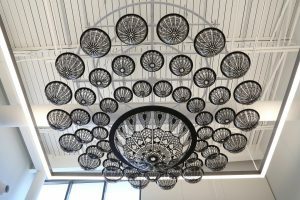 Kistler received her MFA from the Columbus College of Art and Design and has recently completed commissioned artworks for the Dayton Metro Library, the Lincoln Motor Company and the City of Columbus. She is an interdisciplinary artist working primarily in sculpture and photography while using a variety of media—laser cut rubber, CNC router-cut plastic, and 3D printed plastic. Her work focuses on the ubiquity of urban landscapes and the absence of biodiverse spaces. She has shown work both nationally and internationally. Support for this project is made possible by CitySites, the Community Foundation for Kettering and the Ohio Arts Council. In its inaugural year, ArtLocal will work closely with Cities of Service (COS), a City of Kettering program dedicated to innovative ways to harness the power of volunteers and address critical city needs. 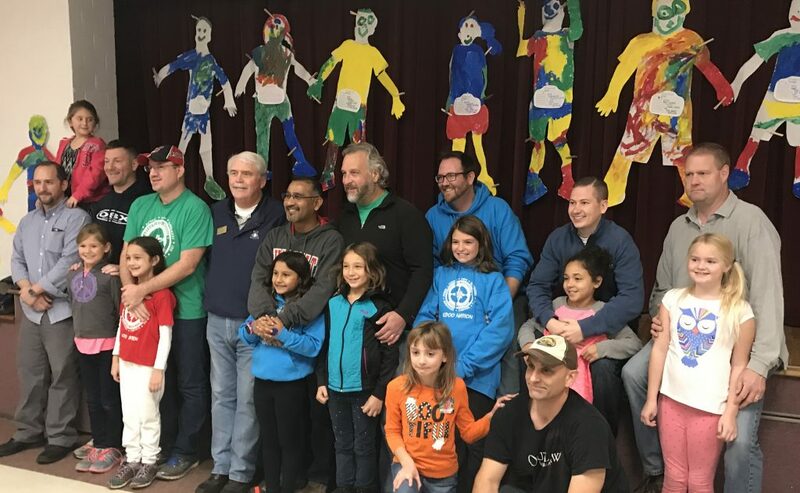 Since fall 2017, artist Virginia Kistler has been working with children, residents and veterans to create a unique piece of artwork for Oak Park. The dedication of this artwork will be in late spring of 2018. Details will be posted on this page! Support for this project is made possible by CitySites, the Community Foundation for Kettering and the Ohio Arts Council. ArtLocal is implemented in partnership with Cities of Service (COS), a City of Kettering program dedicated to innovative ways to harness the power of volunteers and address critical city needs. Scroll down to learn more about the project. Learn about past workshops held in conjunction with ArtLocal. 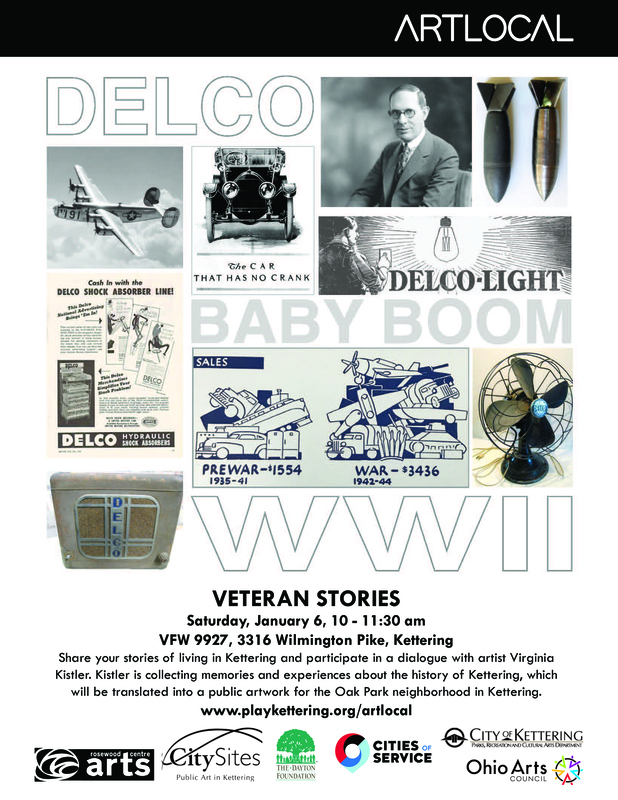 Share your stories of living in Kettering and participate in a dialogue with artist Virginia Kistler. 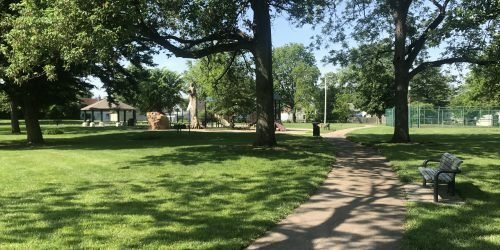 Kistler is collecting memories and experiences about the history of Kettering, which will be translated into a public artwork for the Oak Park neighborhood in Kettering. Support for this project is made possible by CitySites, the Community Foundation for Kettering and the Ohio Arts Council. ArtLocal is implemented in partnership with Cities of Service (COS), a City of Kettering program dedicated to innovative ways to harness the power of volunteers and address critical city needs. Virginia Kistler led participants on paper cut and fold techniques to re-imagine where they live by creating a pop-up house. She also shared ideas about her new artwork for Oak Park. The event was free and open to all ages. 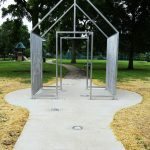 The City of Kettering CitySites Public Art Program is seeking artists, artist teams, designers or architects living within a 125-mile radius of Kettering to design a site‐specific public artwork in the Oak Park neighborhood park of Kettering. ArtLocal is a new initiative utilizing art and creative thinking in localized public spaces throughout the city of Kettering. Through hands-on workshops, dialogues with residents and special events, ArtLocal will facilitate community participation in the development of a collaborative permanent artwork in non-traditional spaces, reflecting their identity and values. ArtLocal will commission a permanent, collaborative public artwork that is significant to Oak Park residents and their identity within Kettering. 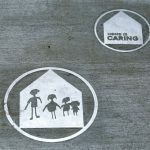 The artwork should utilize enduring materials that can withstand a dynamic recreational space and pedestrian traffic, and can be easily cleaned and maintained. As a collaborative process, the artist will lead interactive workshops and programs initiate and facilitate a dialogue about the city and the neighborhood, and engage youth, families, veterans and people with disabilities in the creative process (which will be organized with assistance from the Division Manager of Cultural Arts for the City of Kettering). Kettering is a suburban city with a population of approximately 55,000 and characterized by socio-economic diversity. The Oak Park neighborhood is located in Northeast Kettering. Oak Park is a 1945 plat development of modest, wood-frame Cape Cod-style homes, with a population of over 1,100. Oak Park was built quickly after WWII to house workers of the General Motors plant, located less than .5 miles away (the plant is now home to Tenneco Inc.). 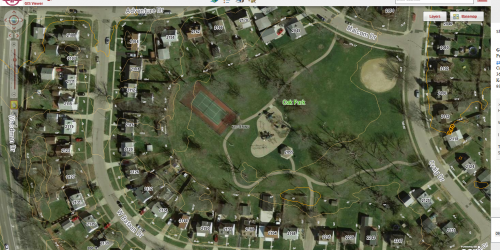 The Oak Park neighborhood has limited public space, however the city maintains a 3.6 acre park (appropriately named Oak Park), which includes a playground, ball field, shelter and walking path. This is the primary public space in the neighborhood and will be the site of the public art piece. 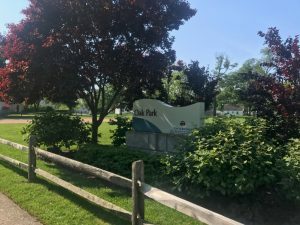 The park is heavily used by residents for daily recreational activities, as well as for neighborhood gatherings in the warmer months. The artist or artist team will be paid $15,000 and is inclusive of all costs associated with the project, including but not limited to: artist expenses, administration, sub-consultants, travel/lodging, artwork fabrication (including materials, details and specifications), storage, transportation and installation, related permits, licenses, taxes and insurance. Any expenses that exceed the contracted amount will be the artist’s responsibility. The artist will be responsible for submitting an artwork maintenance manual upon completion. Artists and/or artist teams must have previously created public art or exterior projects. The artist must carry personal liability insurance for the duration of the project and be willing to meet all contractual obligations. Three references (names/contact information) are required from prior art projects. Artists are eligible from a 125 mile radius of Kettering, Ohio. Employees of the City of Kettering and members of the Art in Public Places Committee and the Kettering Arts Council are ineligible to apply. Parks, Recreation and Cultural Arts staff will review the RFQ submissions and work with an Artist Selection Committee, including members of the Art in Public Places Committee and local stakeholders, to select the artist. A proven ability to coordinate and collaborate with project managers, affiliated professionals and community stakeholders. Artist Name, Address, Telephone, Email Address and Website. If applicable, include Artist Team Members and contact information as listed above. Your interest in this project and your experience working on comparable projects, including your experience with community-centric projects. Include how your work and experience will complement the goals of this project. Describe your eligibility with the criteria as defined in Eligibility section of this RFQ. References, including at least three (3) art and/or design professionals who have detailed knowledge of the artist’s work and working methods, including fulfilling deadlines, working with the community, etc. Please include contact name, organization, address, telephone number, and e-mail for each reference. Resume or CV. Submit a brief, current résumé that includes all contact information and website plus a list of previous public art commissions, design team experience, exhibitions, awards, grants and education, if applicable. If submitting as a team of artists, compile all résumés into a single document. Artist Statement. Please include up to 1000 words about your artwork, process and vision. Ten (10) digital images. In your image caption information, please include the title of the artwork, medium, dimensions, location of artwork and date created or installed. 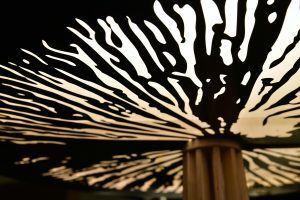 Do I need to submit a proposal for my public artwork idea? No! This RFQ is to provide us with your experience as an artist and working in community engagement. We encourage you to share your project ideas in the Letter of Intent and/or Artist Statement, but it is not required as we hope that the public artwork design will be developed collaboratively with Oak Park residents. I haven’t done much public art before. Can I still apply? Yes! We are interested in an artist’s vision, and will use the RFQ materials of the portfolio, community engagement experience, and the potential of creating a dynamic, collaborative experience. 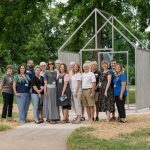 Artists new to public art will have the resources of the CitySites public art program, the Art in Public Places committee, and other affiliated artists to help guide the project. How am I expected to create this project with the community? 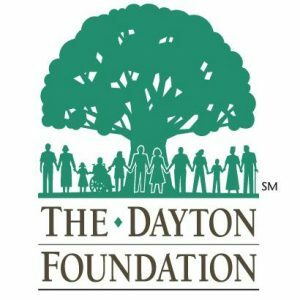 Staff with the City of Kettering (the Division Manager of Cultural Arts) will work with the artist and with community stakeholders to create programs and opportunities for collaborative interactions. This may include workshops, special events, and a presence at neighborhood activities such as with the Kettering City Schools, neighborhood associations, Cities of Service, etc. These activities will take place during the fall of 2017. I have an idea of what I want to make, but don’t know what the budget covers. The artist will work with City of Kettering staff to finalize the design and materials of the public artwork. Based on the final project design, City staff will work with the artist to determine artwork and infrastructure expenses, some of which may be covered outside of the artist’s budget. Kettering’s CitySites is a percent for art program recognizing artistic excellence, accessibility to the arts for all people, and the positive impact of creativity on our community and quality of life in the City of Kettering. View the collection at www.playkettering.org/citysites. ArtLocal is a new initiative utilizing art and creative thinking in localized public spaces throughout the city of Kettering. Through hands-on workshops, dialogues with residents and special events, ArtLocal will facilitate community participation in the development of a collaborative permanent artwork in public spaces, such as neighborhood parks. ArtLocal is managed by Rosewood Arts Centre and the City of Kettering’s Parks, Recreation and Cultural Arts department. In its inaugural year, ArtLocal will work closely with Cities of Service (COS), a City of Kettering program dedicated to innovative ways to harness the power of volunteers and address critical city needs. In 2017-18, COS will be present in the Oak Park neighborhood of Northeast Kettering, and organize neighborhood clean-ups, a community garage sale, and a neighborhood block party. Additional site images and frequently asked questions will be posted at http://www.playkettering.org/citysites through the RFQ submission deadline. ArtLocal is an initiative of the Cultural Arts division of the City of Kettering Parks, Recreation and Cultural Arts. Support for this project is made possible by CitySites, the Community Foundation for Kettering and the Ohio Arts Council.